Easy Oreo Balls (aka Oreo Truffles) made with only FOUR ingredients are a sweet and indulgent no-bake recipe that’s ready in under 45 minutes! 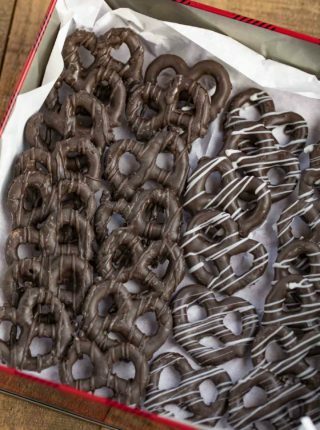 We’re on a holiday chocolate dessert kick this month, topping it off with Chocolate Covered Pretzels, Peppermint Bark, and Slow Cooker Chocolate Peanut Candies! 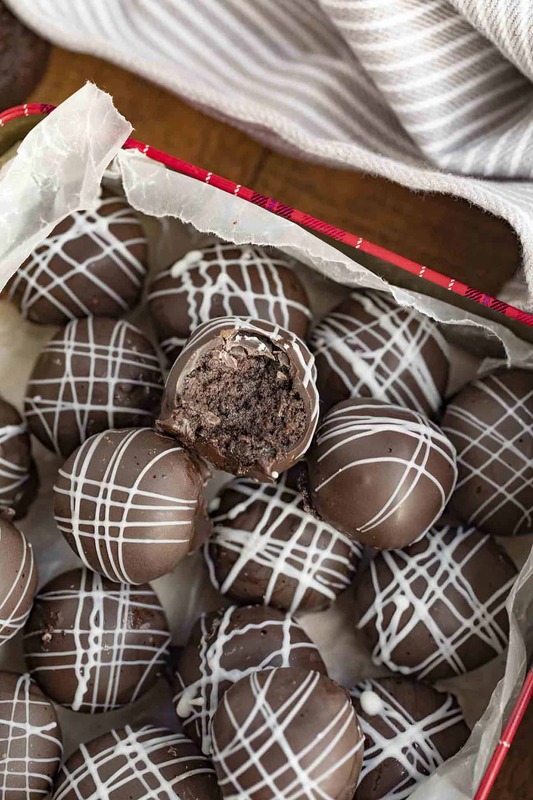 Oreo Balls are the BEST no-bake dessert made from Oreos, cream cheese, and melted chocolate, then decorated with a drizzle of white chocolate. They taste like biting into a tiny Oreo Cheesecake! The real difference is the filling. A true truffle filling comes from using a ganache base which is to say a warmed heavy cream and chocolate base that is cooled vs a cream cheese base. Using a ganache base allows you to keep your truffles at room temperature while using a cream cheese base mixture does not. This recipe, whichever way you’d like to make it, is perfect for little helpers, because all they have to do is roll out the truffle balls and freeze, then dip in chocolate and refrigerate. Plus they’re only four ingredients, so they’re really easy to prep for and don’t cost much to make at all! And I usually have Oreos in the pantry already. 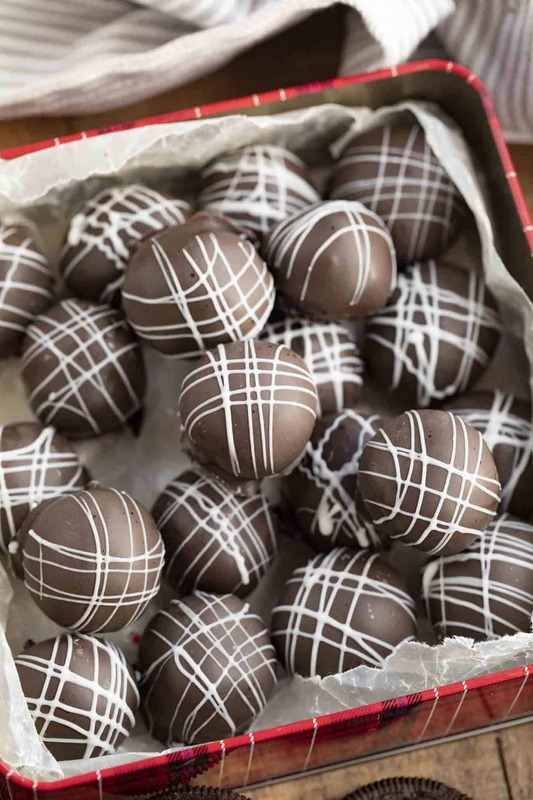 Make sure you’re putting the truffles down on a parchment paper-lined baking sheet or wax paper so they don’t stick. You can also make this recipe using Golden Oreos, that would give you a vanilla flavor vs. a chocolate flavor. I like to do this mixed with freeze dried strawberries for a strawberry shortcake Oreo truffle flavor for clients. Sometimes I roll the still melted white chocolate in macadamia nuts for a white chocolate macadamia nut cookie flavored Oreo truffle flavor. Honestly the flavor options here are just endless. 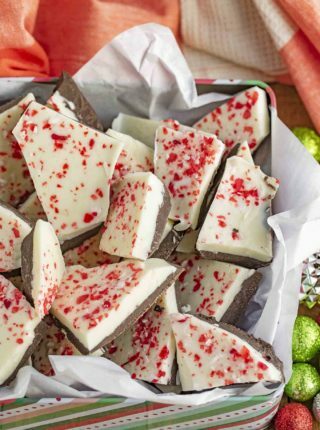 If you want to roll your Oreo Balls in white chocolate and you’re having a difficult time getting smooth coverage or melting your chocolate evenly consider using almond bark. Almond bark is like white melting chocolate like Wilton melting disks but it tastes delicious and it’ll add a dimension of flavor to this dessert recipe too. 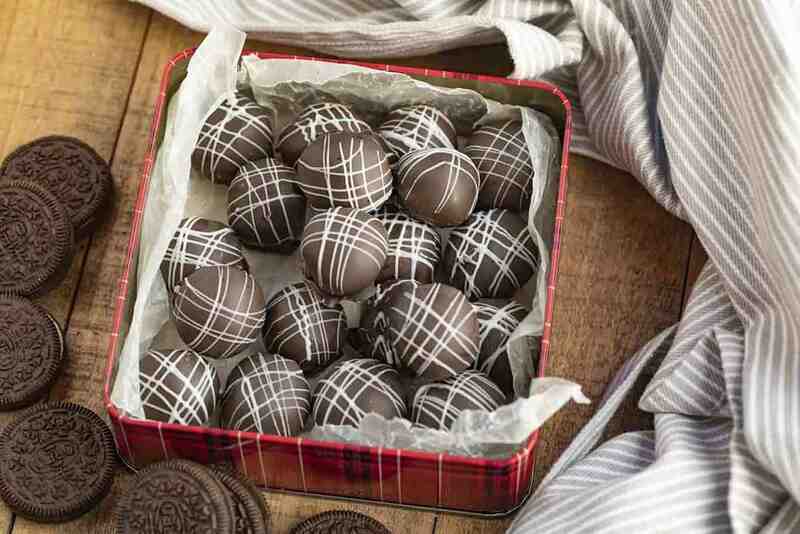 HOW DO YOU STORE OREO TRUFFLES? Oreo Balls use cream cheese, so they have to be refrigerated. First for food safety, but also because they soften as they sit out at room temperature, and won’t hold the truffle together well if it gets too warm. They will last in the refrigerator wrapped tightly for 3-4 weeks. HOW DO YOU DIP OREO BALLS IN CHOCOLATE? The trick to dipping them in chocolate is to freeze them until they harden, a total time of 15-20 minutes. Then you can pick them up with a fork and just dip them in the chocolate. The cold temperature will help the chocolate set, too. You can swap milk chocolate for dark chocolate in this recipe. CAN OREO BALLS BE FROZEN? You can freeze these for 3-4 months in an airtight container. 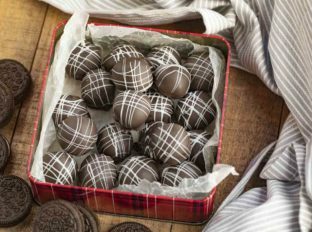 This is the perfect make-ahead recipe for the holidays because you can make a big batch of truffles and freeze until you’re ready to serve! Then just pull them out and let them defrost in the refrigerator for a few hours before serving. HOW DO YOU MAKE OREO BALLS WITHOUT CREAM CHEESE? HOW DO YOU MELT CHOCOLATE FOR OREO BALLS? The fastest way I know is to put the chocolate into a microwave-safe bowl and microwave for 30 seconds at a time, stirring each time to make sure it’s melting smoothly. Just make sure the chocolate isn’t too hot when you dip the truffle balls in. 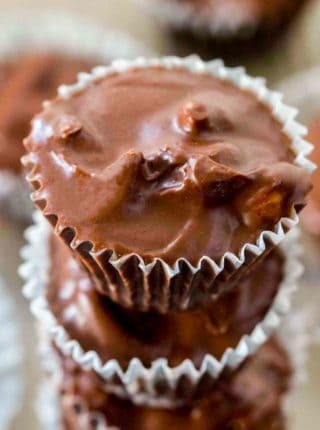 You can also add the milk chocolate to a double-boiler and stir until it’s smooth and melted. This recipe uses semi-sweet melting wafers for the main coating, but you can swap that with the white chocolate if preferred. Use another type of cookie instead of Oreo cookies to make this recipe, like my Award Winning Gingerbread Cookies. Before the melted chocolate hardens, sprinkle with crushed cookie crumbs, crushed candy canes, mini chocolate chips, nuts, or sugar for decoration. If you don’t have a food processor, use a large resealable plastic bag and a rolling pin to gently crush the Oreo cookies. Use an ice cream scoop before you roll them in your hands to ensure that all of the balls are about the same size. Alternately you can also roll in chopped dark chocolate and allow that to dry for a chunky chocolate look. If your chocolate coating is too thick (if you’re using chocolate chips or chopped chunks of chocolate) you may want to think out your chocolate with just a drop or two of coconut oil, it’ll make dipping much easier. Oreo Balls (aka Oreo Truffles) made with only FOUR ingredients are a sweet and indulgent no-bake recipe that's ready in under 45 minutes! 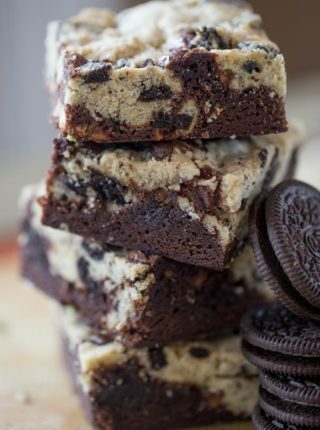 Add the Oreos and cream cheese to a food processor and process until smooth then roll the mixture into 48 1" balls and place on a cookie sheet lined with parchment paper, freezing for 20 minutes. Melt the semisweet chocolate and dip each ball in it with a fork scraping the bottom before putting it back on the parchment paper. Melt the white chocolate and put it in a small ziplock back with the end snipped off and pipe the white chocolate on in a criss cross pattern before letting it harden completely. These were super fun to make, we used marshmallow fluff to make them. They worked out so well. We also used more cookies and since we didn’t have a processor we used the mixed after we smooshed the Oreos. It turned out real well, but we did have to use a little more of the marshmallow cream but it’s all good. I’m so glad you guys enjoyed it! Thanks for coming back to let me know! These would disappear in our house! Craving for these! These look seriously delicious, especially for the holiday party I’m throwing this weekend! I can’t wait to try them! Oh wow!! These are ahhmaaazing!!! I am definitely going to make them for the holidays!! So glad you love them! What a great idea for a little sweet tooth! These balls look divine! I am definitely craving these balls! I wish i had some with my morning coffee! These are mouth watering! It will quickly disappear on our house, so excited to try this!